This evening I am alone and On THE Road, where nothing is Divine. I stand here with no luggage, with no thumb hitching no ride, I am just here waiting for ‘this Train’ to the Great Unknown to take me away. I don’t even have a book to read. Tonight I won’t be bothered by reality. Beneath the moonlight shadow of a giant tree by the highway, I come to terms with destiny not being met, once again. Not even cigarettes, just mist. Only the vast deformity of our future taking shape, only the paranoid delirium of persecution from I to I, and the echo of a woman’s voice in my empty head. In this erased head of mine. Silence becomes a fertile field for predators. We are seeking buyers of dreams. Extinction? Not a worry, there’s no lower than low. I’d rather bare myself for witness: nuclear bombs going off inside her heart (I never watch TV). In my arms, she is a blue million miles away. OMG: In my arms she is here tomorrow, gone today. If we are sacred, we will swing through the night, babe. You got a glow on you. I jumped over The Wall tonight, babe. I’ve cheated death once again, with a two-headed coin, and my .22 so smooth, like a girl’s gun, so black, so shiny. What? If you are playing cards with your memories, you better bring a gun to the fight, right? Through your eyes, I see the clouds in your Heart, sweet ‘angel star’. I guess we walked with the right shoes through the wrong door, didn’t we, luv? This love is our sanctuary. This love is our river of blood. Electric storm. Electric storm all around me but I don’t get wet (no, that’s not what she said, you perverts!) Breathe in deep, hold your hands up towards the Zenith Moon, under this lonesome tree, under this sleepless tree bothered by the Full Moon. Who’s there? “I thought we was alone” (sic). This plot-less dream is a catastrophe of Biblical Proportions. Good thing is I only carry a pocket Bible around… just in case I get shot in the chest. Well I think that sums it up, chief. Love is a flame. When I get home, I’m gonna shed off these dirty rags, and then put on some other rags. My best rags.Gonna spray my hair, and wear my best wristwatch. And the speakers on my Coupe will blast through the city at night, as I speed towards the next exit, always towards Her and Her alone. Towards she who’s never there. She: the Great Unknown. These are easy times, what without the medicines, what without the great expenditure it is to make it rain. These worlds are almost real, babe. I will now allow myself to float in the nostalgia of her imaginary voice in my head. 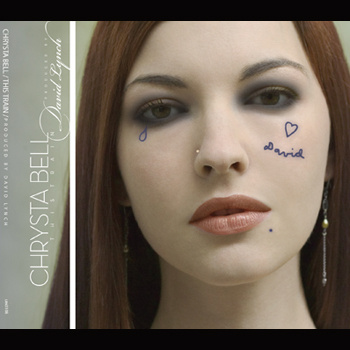 Posted in Creative writing, reviews, Where's my mars barTagged Chrysta Bell, David Lynch, This TrainBookmark the permalink.